Designed to grow with your baby from 4 pounds to 50 pounds, the Fuze Travel System with Prodigy Infant Car Seat is the most innovative on-the-go system. With an all aluminum stroller and award winning car seat, this travel system combines air-light convenience with superior functionality to deliver a stylish and smart, all-in-one travel solution. At Summer Infant, we strive to delight moms and babies, and walk beside you in your parenting journey by providing you with safe and innovative products that provide peace of mind. Featuring stylish functionality, the Fuze is designed to grow with your baby from birth to toddler, up to 50 pounds, and can be used through all stages of your baby’s first years: 1) Travel System: For the first months of your baby’s life, simply attach the included car seat adapter to the stroller frame and click in the Prodigy Car Seat. Convenient and lightweight, this eliminates the need for an additional snap and go frame for your infant seat. 2) Rear Facing Stroller: Once your baby is old enough, attach the stroller seat rear facing to have important face-to-face bonding time when on-the-go. 3) Forward Facing Stroller: As your child becomes more curious, turn the seat around so they can see the world and interact with those around them. With an all-aluminum frame, the Fuze stroller is incredibly durable yet surprisingly lightweight. Weighing only 22 pounds, the Fuze is one of the lightest strollers on the market and one of the only strollers that is able to fold with the seat or car seat adapter attached. 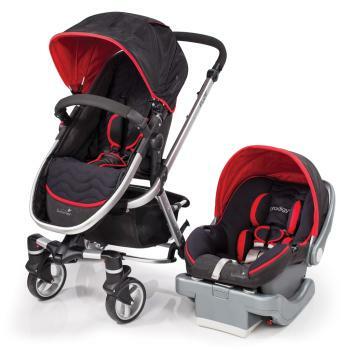 The stroller is trunk friendly and effortless to fold requiring only three simple steps: 1) Press buttons in, 2) Pull level up, 3) Lower down to engage the auto-lock. For even more compact storage, rotate the handlebar into the highest position and stand stroller on handlebar for a standing fold. With the help of patented SmartScreen Technology, the Prodigy Infant Car Seat is easy to install and will tell you that you have installed the base correctly. SmartScreen Technology makes installing the base as easy as 1-2-3: just Click, Level, and Tighten. The patented belt tightening system allows you to effortlessly secure the car seat base to your vehicle seat. By simply ratcheting the handle back and forth, you are able to tighten the base easier than any other car seat: no more pulling on straps and pushing tirelessly on the base to try and obtain a secure installation. If your vehicle does not have LATCH anchors, don’t worry: the patented belt tightening system can be used with a lap belt or lap and shoulder belt. The large adjustable canopy will block your baby’s sensitive skin from harmful rays and the magnetic peek-a-boo window allows you to quietly check on baby. The padded seat with five-point safety harness effortlessly reclines into three comfortable positions for baby to nap on-the go. The height adjustable handlebar adjusts an amazing 14 inches, and will be comfortable to push whether you are taller or shorter; even big brother can help push baby. The bump bar opens from the left side, right side, or remove completely, for easy access to baby. Plus, the pedicure friendly rear brake easily rocks back and forth to lock and unlock the wheels, which means no more scuffing your shoes or chipping your pedicure. The Prodigy Infant Car Seat features a patented 1Adjust Harness. This harness system automatically adjusts to your baby’s size every time, with no re-threading ever required, and eliminates the confusion of determining the correct slot for the harness. The Prodigy Infant Car Seat also comes with a removable newborn insert and headrest that is ideal for comforting and supporting smaller babies, even 4-pound preemies. Rain, shine, summer, or winter, you will be ready for any weather with the Fuze accessories (sold separately): A rain shield for those stormy days, a mosquito net for buggy spring months, a baby boot to stay cozy during the winter and a stroller bassinet for the first months of your newborn’s life. Additionally, the extra-large foam wheels feature front and rear suspension with locking front swivel wheels, which means your baby will always have a smooth ride. Whether strolling on flat pavement or rocky, uneven surfaces you will always have a smooth ride, thanks to the durable foam wheels with locking front swivel wheels and front and rear suspension. The front wheels measure 6.5 inches in diameter while the rear wheels measure 9 inches in diameter.